In this article, I have compiled a list of 5 free photo resizer Android apps. These apps will let you resize photos on Android with ease. You can select a photo from your gallery or even click a new photo from the camera to change their dimensions or size. The best part is that you can resize photos on Android just as would on any standard desktop image editor i.e. specify custom dimensions and choose to maintain the aspect ratio of the photos. Some of these Android photo resizer apps even let you view the resized photos and share them right from their interface. Also See: 5 Free Android Apps To ZIP files, 4 Free Android Apps to Share Screen with Other Android Users, 5 Free Android Apps To Improve Accents. Photo & Picture Resizer is a free Android app to resize photos on Android. You can select multiple photos and resize all of them to the same photo dimension. So, if you have multiple photos on Android to resize, then you can select all of them and resize in just a few taps. Download this app from the link provided above and then select the photos to resize from the app’s interface and then tap on the photo resize button. After that, specify the dimensions of the photo as per the photo to be resized. The app then starts resizing the selected photos and save the resized photos to the phone. You can also see the resized photos within the app itself and share them to social media. Photo Resizer is another free photo resizer Android app. The interface of this app is pretty straightforward, which makes it easy to use. 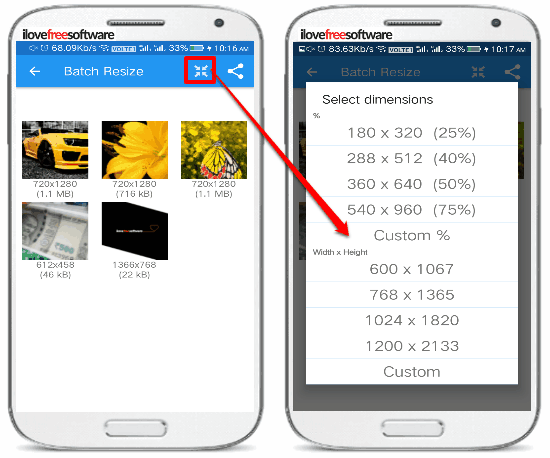 Select a photo from the phone gallery and then specify a custom size. After that, app resizes the selected photo to the specified size and saves it to the phone. After resizing a photo, the app also gives you the option to share the photo. To ensure that the photo is resized as per the specified dimensions, make sure that the “Keep Image Ratio” option is disabled. This option automatically adjusts the height of the photo as per the specified width and thus alters the photo dimensions in the background. The developer of this app needs to take a look at it as it might get annoying to turn off and on this option, again and again, to resize photos as per the desired dimensions. The app even alters the photo dimensions if you have selected the preset dimensions, as shown in the screenshot above. So, make sure that you disable aspect ratio option while resizing photos as per the specific dimensions. Photo Resizer HD is another free photo resizer app for Android. 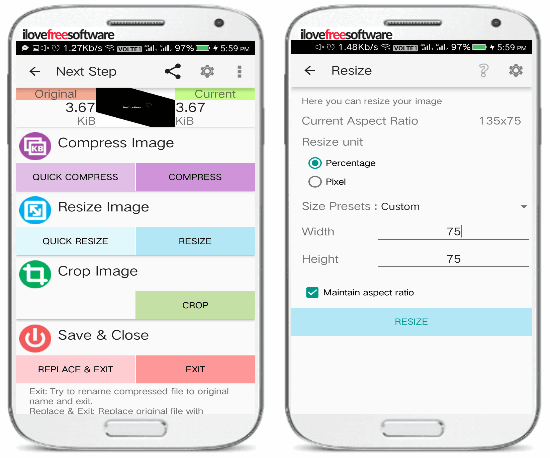 This Android photo resizer app also lets you resize photos in batch. As compared to other apps on my list, I really liked the interface of this app as it looks similar to an image editor. In addition to resizing photos, you also get the options to crop photos, flip them horizontally and vertically, and rotate them. Tap on the Gallery button on its main screen to select the photos to resize. After that, simply tap on the button to specify the custom dimension and resize the image. At last, tap on the right button on top of its interface to save the resized photo. 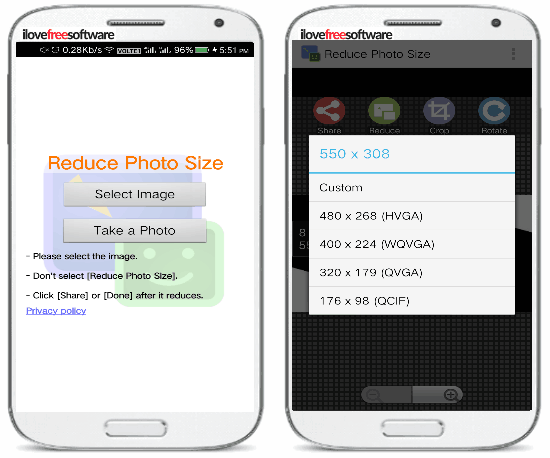 Reduce Photo Size is another free photo resizer Android app. You can also crop and rotate. Like other Android apps to resize photos in this article, this app also lets you select photos from the photo gallery or you can even click a new photo to resize on the go. The resized photos are saved on your phone at last. You can either choose a preset dimension or specify a custom dimension to resize images. 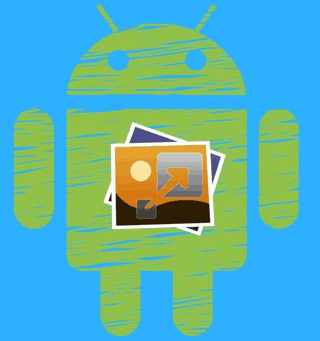 The steps to resize photos on Android with this app are quite simple, as you just have to select photos from your gallery and then specify a size or dimension. After that, the photos will be resized as per the specified dimensions and saved on your phone. Photo Compress is another photo resizer Android app. You can resize multiple photos using this app. The best of this app is that you can also compress photos i.e. reduce size of photos on Android. It also gives you the option to compress multiple photos at once. In addition to compress and resize photos on this app, you can also crop photos on it. To resize photos, you can select a photo from the phone gallery. To import photo from the phone, tap on the Gallery option from its main screen. After that, you will see the selected photo on its interface as shown in the screenshot above. Now, just tap on the Resize button to bring forth the options to change the size of that photo. You can specify the photo dimensions in pixel or percentage unit. If you want to resize the photo in a fixed resolution, then disable the “Maintain aspect ratio” option. 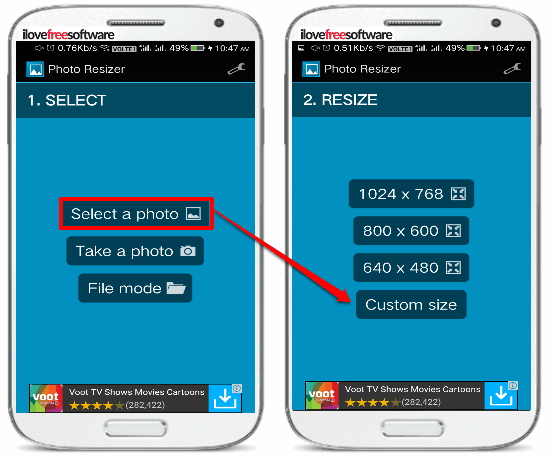 At last, click on the RESIZE button to change the size of the photo and save it on your phone. 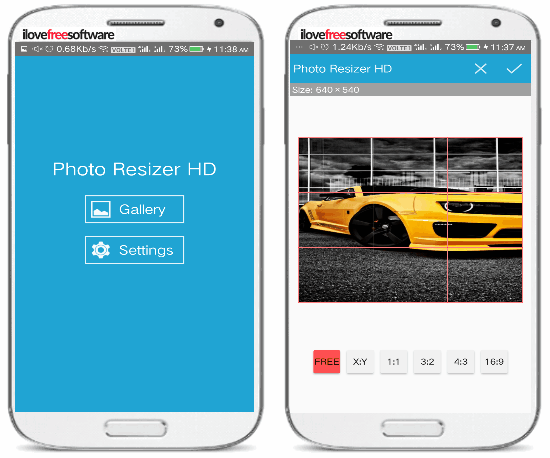 In this article, I introduced you to 5 free photo resizer Android apps. These Android apps will let you resize photos on Android and the best part is that you can resize multiple photos at once. I like Photo Compress, Reduce Photo Size, and Photo & Picture Resizer the most, as these apps also let you compress photos, flip, rotate, and crop photos. So, check out these apps and let me know which one you find more useful.